Turmeric is a spice grown in Indian backyards and kitchen gardens. Turmeric is not just another fad – it adds taste to your dishes and provides many health benefits. In the Ancient Indian health practice of Ayurveda and Ayurvedic Medicine, turmeric is used in many preparations. Studies show that turmeric contains anti-oxidants which help protect our immune system and may help the body fight off cancer. There is also research being conducted to connect turmeric with arthritis pain relief. However, if someone is introduced to turmeric for the first time, it may taste unpleasant. There are ways around it. There are numerous turmeric recipes which will help you consume this super herb without causing issues to your taste bud. Here is a simple and easy to make set of recipes. 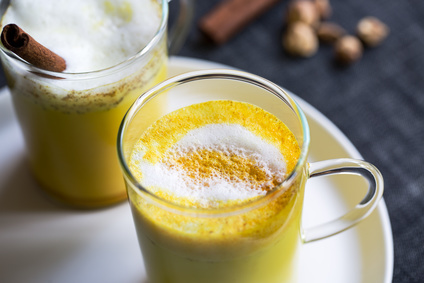 You can prepare turmeric latte golden milk as per your tastes and preferences. Here are a few simple and delicious recipes you can experiment with. Take one cup of coconut milk, two teaspoons of turmeric paste, one tablespoon of grated fresh ginger, one teaspoon cinnamon and one tablespoon of coconut oil. Warm the coconut milk in a pan. See to it that it is not boiling. After a few seconds, add turmeric, cinnamon and ginger into it. Add coconut oil into the solution and heat until it melts. You can use an immersion blender to create foam. Heat the entire thing until it starts producing froth. Optionally, sweeten it using a bit of honey. • One teaspoon of maple syrup. Replace with honey if that is what you prefer. 1. Blend all the ingredients in a high-speed blender until the solution gets smooth. 2. Pour the mixture into a sauce pan and heat. Do not boil. 3. Drink as soon as you can. Note: This recipe may stain your blender. But it does not cause any harm and fades away with time. Turmeric latte in itself is mouthwatering. When combined with a tablespoon of butter or ghee, it gets creamier and tastier. Blend all ingredients in a blender until the solution gets frothy. Gently warm the mixture and pour it into a glass. Sprinkle cinnamon, serve and enjoy. Spices like turmeric boost the flow of blood to your organs and helps them the oxygen they need. The more oxygen they get, the healthier they become. Turmeric may regulate blood sugar and may be superior to some of the conventional medications available in the market in this regard. Turmeric may also have many anti-inflammatory properties. To know more about Ayurveda or to have an ayurvedic consultation or an ayurvedic treatment, kindly get in touch with Ayurwoman Ayurveda Clinic, Melbourne. Ayurwoman specializes in Ayurvedic management of womens health issues such as treatment for pcos, endometriosis, fibroids and ayurvedic skin care and hair care.